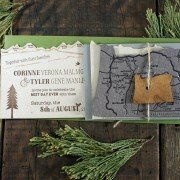 Twin Ravens Press would like to send a big congratulations out to our clients, Josie & Matt who were married at a sweet farm ceremony in Brownsville, Oregon, last Saturday! Josie and Matt were married outside of a historic Victorian farmhouse and garden at AtaVista Farm which was built in 1876. 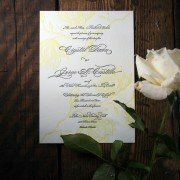 Josie wanted their wedding invitations to be simple, beautiful, and incorporate their wedding colors, which she described as “Peaches ‘n Cream”. 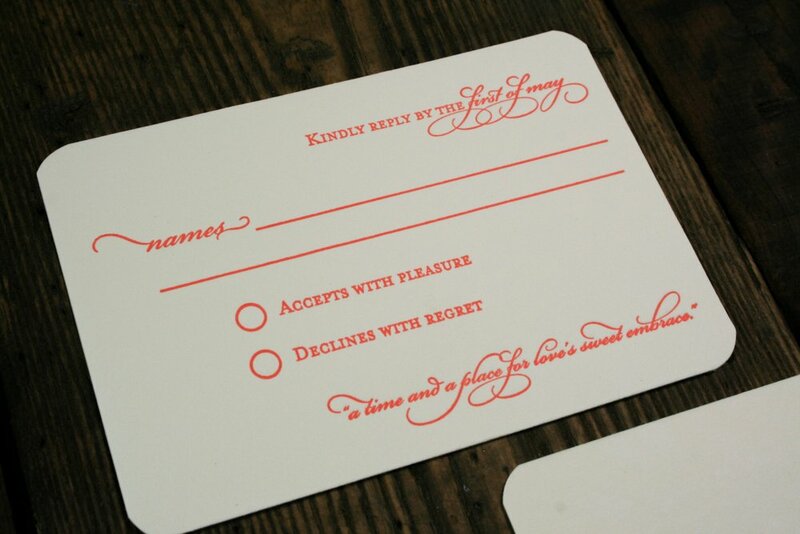 They ended up choosing to modify our Yours Truly Wedding Suite to fit their stationery needs. 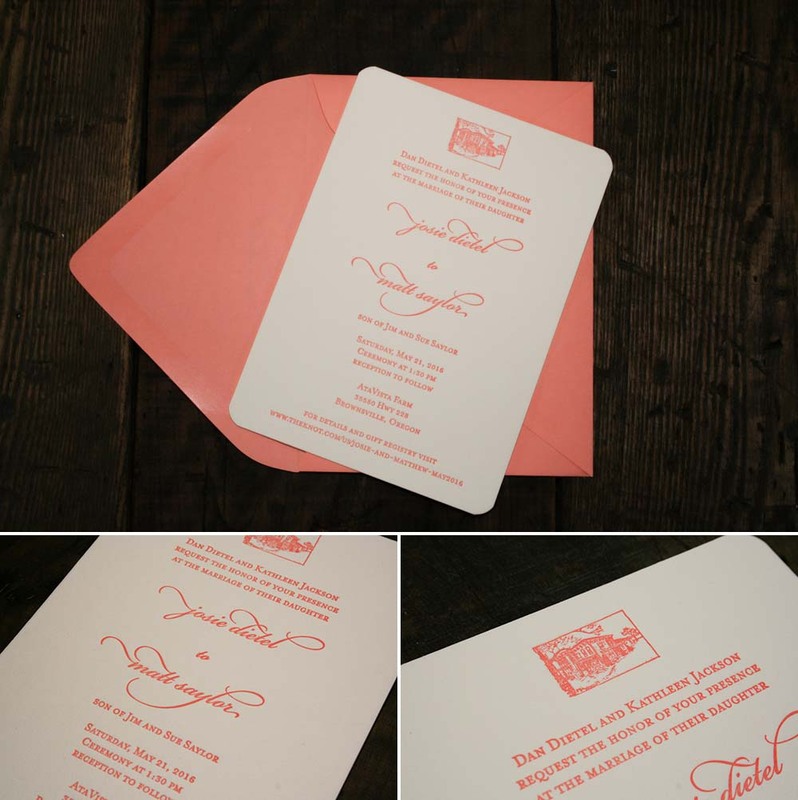 Josie and Matt’s take on the Yours Truly suite featured an A7 size wedding invitation and 4bar size rsvp postcard that were printed in a single color, a nice deep coral/peach. 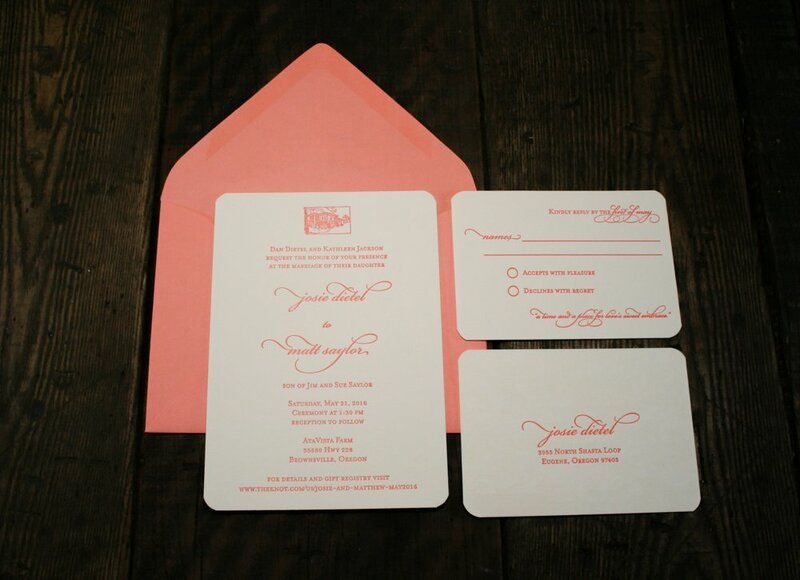 It also came with a coordinating invitation envelope in that same coral/peach color printed with their return address. 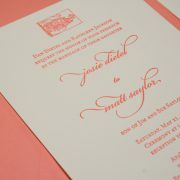 Josie chose a really warm “Natural White” 100% cotton paper from Holyoke for the invitations and reply cards. We also rounded all the corners on the two cards to give them an even softer touch. 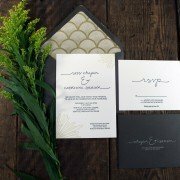 The top of Josie & Matt’s invitation featured the image of the Victorian farmhouse at AtaVista Farm, which you can also see on their website. Aside from adding the little photo motif to the top, we kept the remainder of the fonts in the design consistent with our original Yours Truly suite. 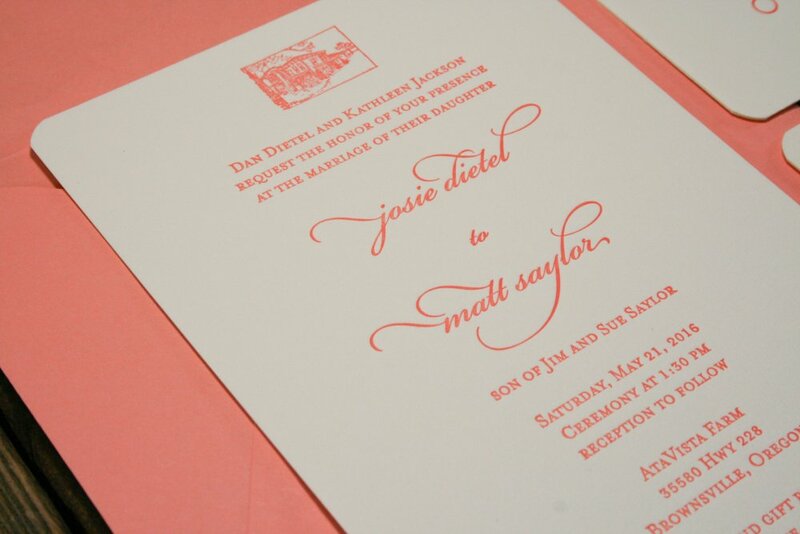 I love the way Josie & Matt’s names looked in the modern, all-lowercase script font that we used! 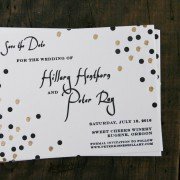 To save a little on postage and paper, Josie & Matt chose to do a reply postcard in lieu of a card and envelopes for their rsvps. This postcard was printed double-sided and had their standard RSVP information on one side and their return address on the back. 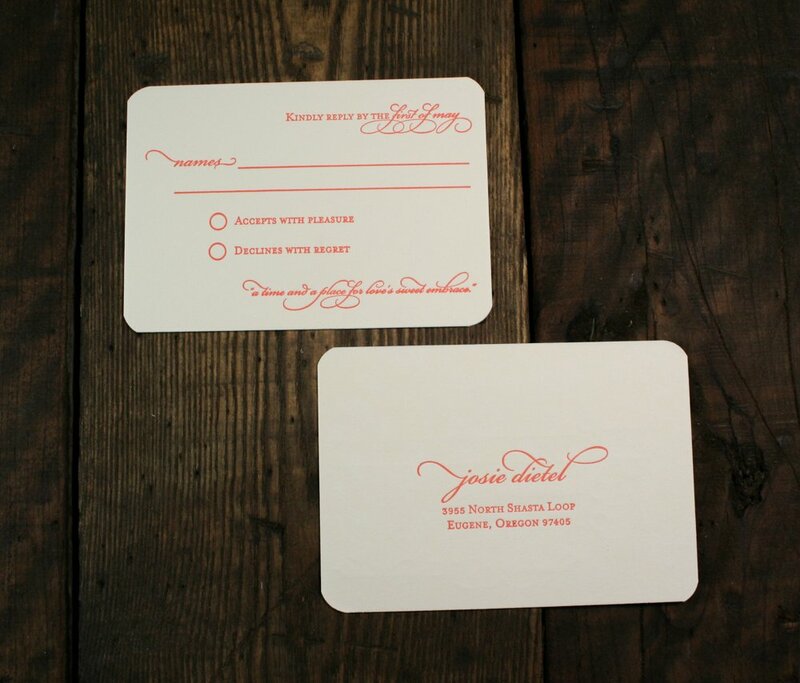 This card was also printed in the same peachy-coral ink color we used for their main invitation. Aren’t they pretty?!? 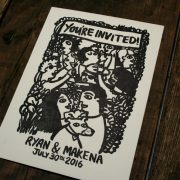 Thanks so much Josie & Matt for working with us on your wedding invitations! I’m sure the wedding itself was just beautiful!! Congratulations! 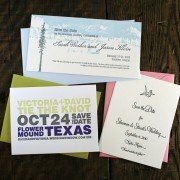 May Custom Printing Special: 20% Off "Floral" Wedding Collection Invitations!